Information Technology is a part of everything we do, at home, at school, at work, in government, business and the community. But it’s about more than just computers. It includes all of the technology that allows us to share and store information. That is all of our devices, television, the radio, the Internet and the intricate tangle of digital systems and computer networks that move data through cyberspace. IT at our fingertips allows us to make phone calls, shop, listen to podcasts, plan itineraries, book flights, access government services, pay our bills, apply for jobs and participate in online communities. In other words, IT allows us to connect – and as we connect we leave a trail of information about ourselves, and that’s a LOT of data! Although IT has improved the way we connect, it’s also made us vulnerable to cyber crime. That’s where cyber criminals: fishing scammers, Internet stalkers, identity thieves and cyber terrorists hack into systems and steal data to commit crime. Online crime costs Australians and Australian businesses millions of dollars and a lot of heartache every year. It’s even a threat to our national security! All of this means that jobs and careers in the cyber security industry are a sure fire bet for the future, whether that’s in private industry, government, law enforcement or Defence. Don’t go over to the dark side of Black Hat Hackers. 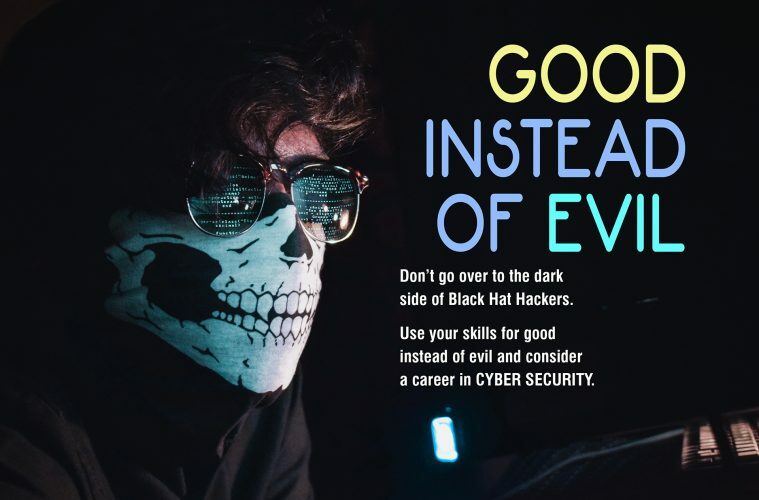 Use your skills for good instead of evil and consider a career in CYBER SECURITY. TAFE offers national cyber security certification courses, and universities throughout Australia offer Bachelor Degrees in computer science and information technology. Check out the TAFE website in your state or territory, and the websites below to find something that suits you. You can find out more about IT and CYBER SECURITY in the new Work-Ready module coming soon!